← Happy New Year ! Monster Party show at Dragatomi !! It was a cold and grey day in San Francisco as we set out for the Monster Party show at Dragatomi in Sacramento. I suppose this weather is fitting for a theme such as this. It would not be right to have a nice sun shiny day now would it ? 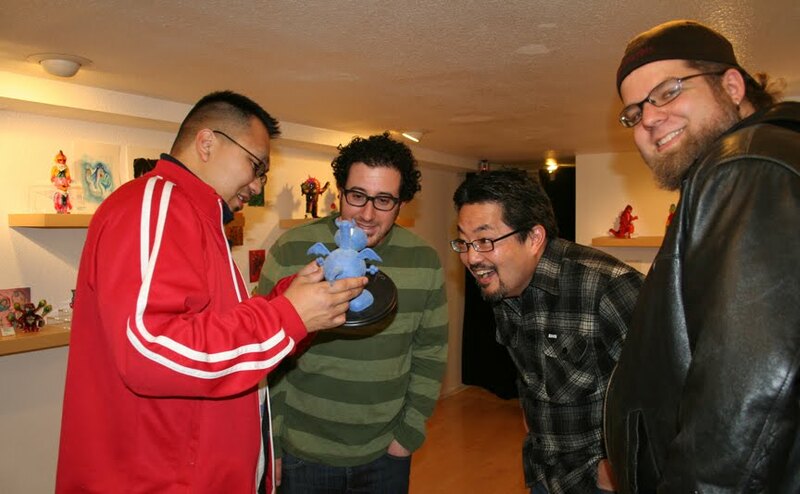 A group show, featuring myself ( Mark Nagata ),Gatchabert, Lil Japan and DLUX. After an hour and half drive (not bad) we arrived at Dragatomi. This was my first time there and they have a very nice store along a block with many interesting shops and antique stores. I was wanting to take a peek in one of those stores, but we needed to set up so did not get a chance to. As you can see the store is well laid out and each figure is in its own space without being over crowded or having a cramped feeling. Gatchabert and myself were the only ones who could attend, so we started in on the set up towards the back of the store in their gallery space. Each of us took a section and or shelf. 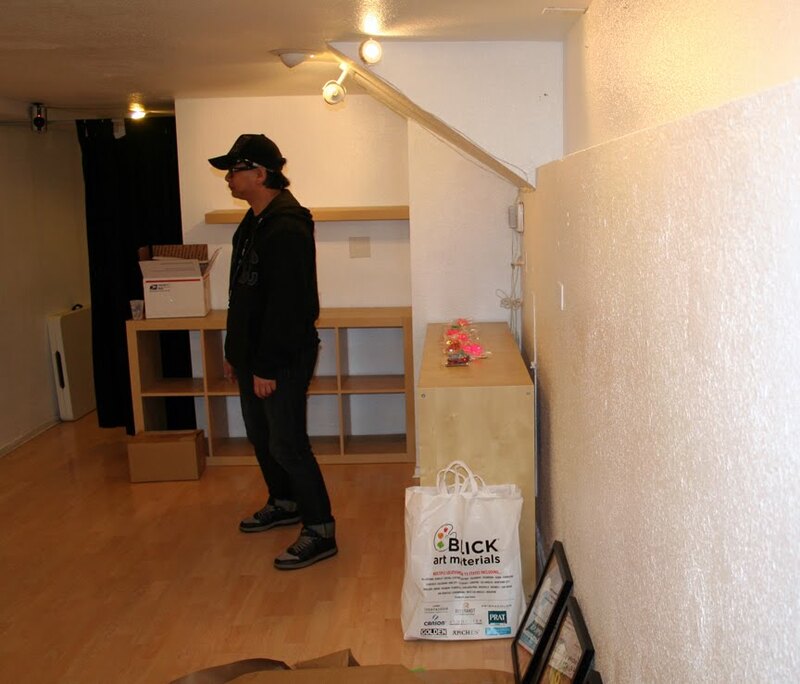 Lucky for me Gatchabert set up Lil Japan’s 6 paintings .. I’m awful at hanging art ! 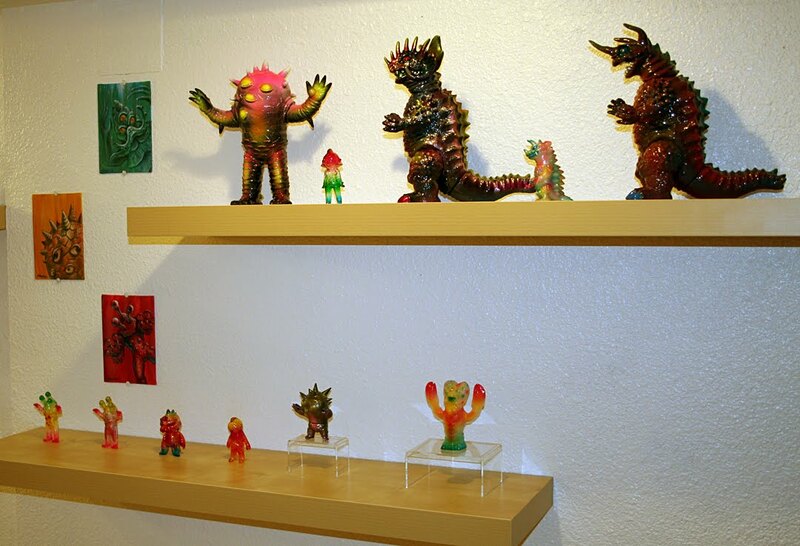 above Gatchbert and his custom RealXHead figures along with original paintings he did.. nice ! 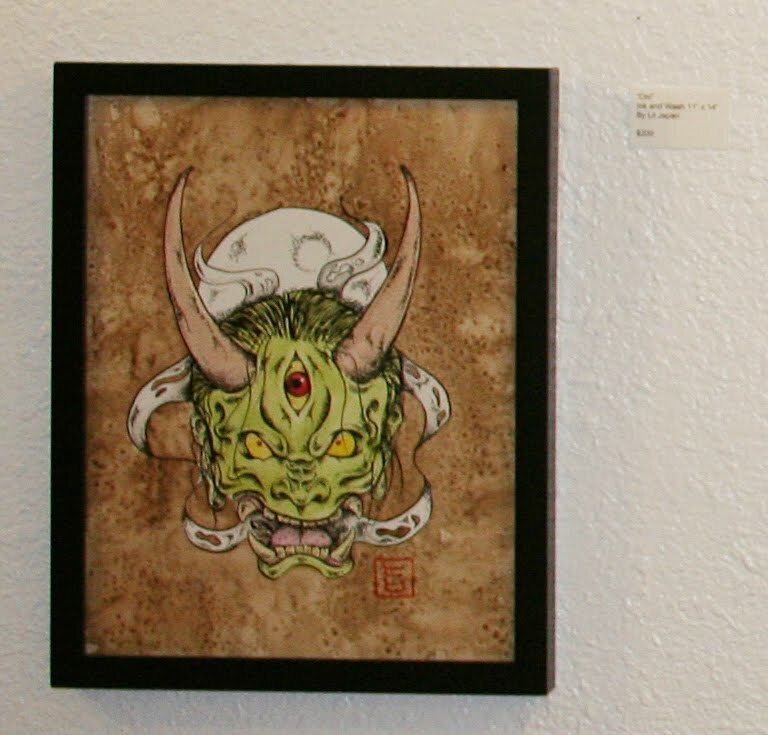 above, Lil Japan had 6 pieces, this was my fav, ONI ! 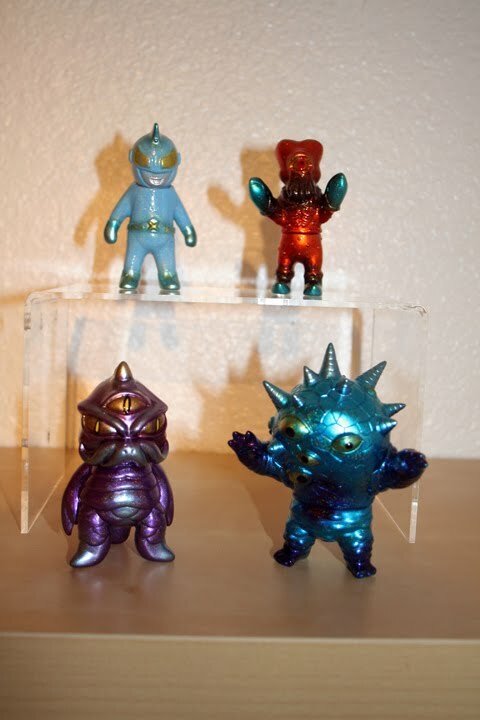 above, DLUX shines on these Max Toy minis ! 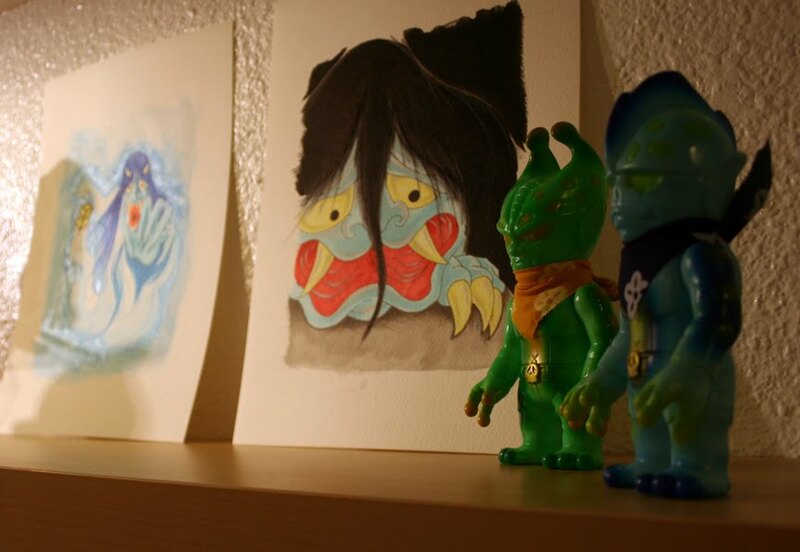 above, my figures and some paintings (>v<) ! 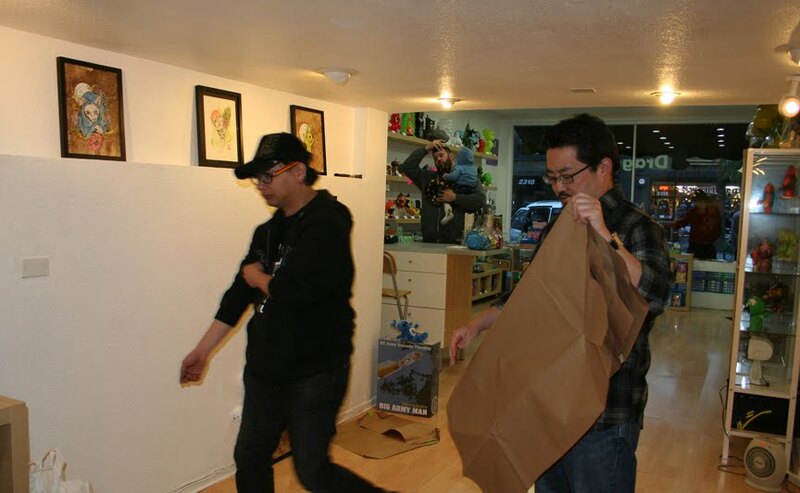 Here’s co-owner, Ray , showing us the figure is flocked ! My stupefied look caught forever in digital history ! 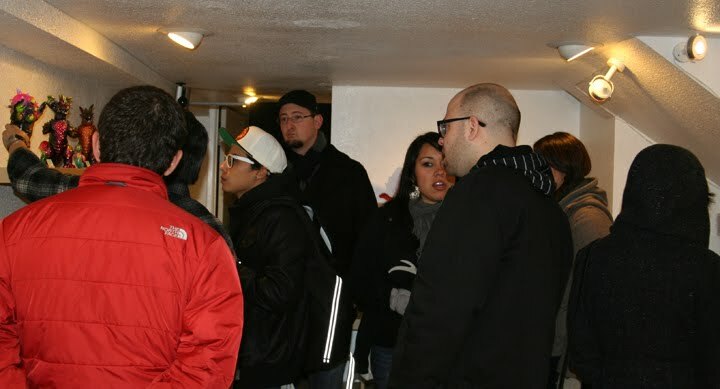 We had a great turn out for the show .. actually truth be told more than I thought(!) given the weather … You never know when your in a show if anyone will show up .. but Dragatomi has a very loyal following .. and I know why .. Joanne and Ray and staff are friendly and approachable and very customer friendly. Thank you to everyone who came out in the cold ..I think we got some new Kaiju folks and showed how cool these customs are in person. above back left to right – Gatchabert, Joanne, Ray, LapTop, Mark and Quan. All good things must come to an end and finally as the last customer left, we took a final picture ! Oh and thats the lap top with Ustream running 😉 .. good gosh hope we didn’t say anything dumb while it was on ! Ha ha .. I’m sure we did .. oh well ! 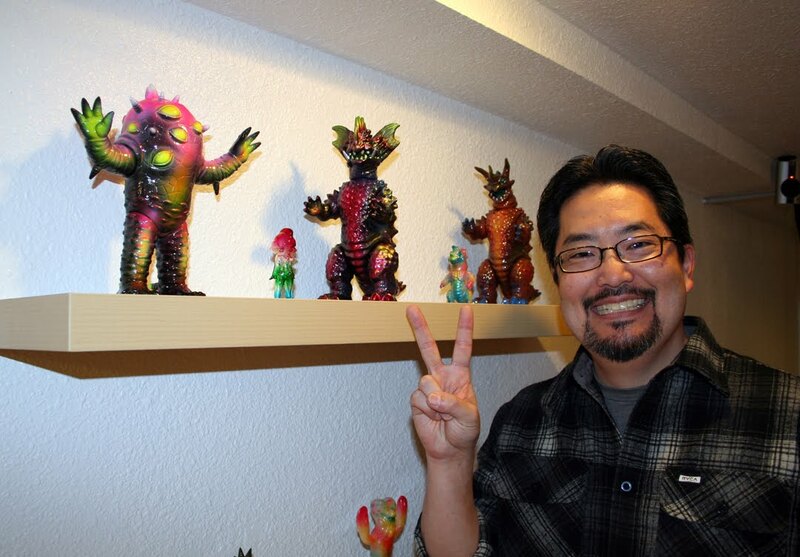 This entry was posted in dragatomi, Japanese toys, mark nagata, Max Toy, Max Toy Company, monster kolor, soft vinyl. Bookmark the permalink.